If epilating your legs is something you want to start doing, then learning how to exfoliate legs is a natural first step in the learning process. Exfoliating keeps the dead skin cells off your top layers of skin, which can prevent hairs from getting trapped beneath the surface, leaving them to turn into ingrown hairs. Learning how to exfoliate your legs before shaving and epilating can be a number one defense against those pesky ingrown hairs and can also leave your skin feeling softer and looking healthier. This guide will teach you the best way to exfoliate legs and some helpful tips to get you through the process. Knowing how often you should exfoliate your legs is important, but the answer will vary slightly with everyone, depending on the type of skin you have. As a general rule, you can benefit from exfoliating your legs the day before you epilate. However, this is the minimum for which you should aim. It’s best to get yourself on a regular exfoliation schedule to keep dead skin cells away and allow new skin cells to come to the surface. For most people, once or twice a week is a good goal. If you notice that your skin becomes irritated after the second exfoliation, which can happen to people with dry or sensitive skin, then bump the frequency down to once a week or less. Fortunately, your legs have some of the toughest skin on your body, so even if you’re prone to skin irritation in other areas, you may not experience much irritation on your legs. Before you learn how to exfoliate your legs, you should learn what to use to exfoliate your legs. Some people use store-bought scrubs and peels for exfoliation while others make their own scrubs. There are two types of exfoliation products you should become familiar with: mechanical and chemical. You can use either one on your legs. Mechanical exfoliation refers to the process of sloughing away dead skin cells using a scrub or brush. The mechanical process uses abrasion to remove dead skin cells. Mechanical exfoliation is the most common type to use, especially when you’re just learning how to exfoliate legs at home. However, people with dry and sensitive skin can sometimes see a lot of irritation from the abrasiveness of mechanical exfoliation products. Chemical exfoliation refers to the process of using chemical-based scrubs and peels that use enzymes or acids to remove dead skin cells. Chemical exfoliators are non-abrasive, so some people find them to feel a little more natural. Both types of exfoliating products can work well, but your skin type will be the final judge of what kind will work best for you. Those with sensitive skin or some skin conditions should ask their dermatologist for recommendations. When you’re searching for the best product for your skin, be sure to pay attention to labels. Often, manufacturers design their exfoliating products to work on various skin types. One formula may be better for those with sensitive skin than oily skin, for example. People with oily skin can choose a product with more abrasive properties or a higher salicylic acid concentration to penetrate the skin. If you have sensitive or dry skin, look for a scrub with gentle abrasion or a peel with a low acid concentration to prevent skin from irritation. Some people learn how to exfoliate legs by experimenting with homemade scrubs designed for their skin. DIY scrubs can be as gentle or abrasive as you need them to be, so you can create a perfect match for your legs. Most scrubs use sugar or salt as a naturally abrasive main ingredient, alongside natural oils and juices for great-smelling exfoliators that keep skin soft and healthy. Mix the ingredients thoroughly before using. Now it’s time to learn how to exfoliate your legs! It’s a good idea to get into the habit of exfoliating first thing in the morning. As you sleep, your body creates new skin, which means that more dead skin cells will be on your skin when you wake up. When you exfoliate in the morning, you’ll get as much of these skin cells off as possible. If you do choose to exfoliate every morning, be sure to use a gentle scrub to prevent irritation. Before you step into the shower, prepare yourself for exfoliating to make the process as simple as possible. First, gather your materials. You should have your scrub or peel in a convenient spot, along with an exfoliating brush, loofah, or washcloth, depending on your preferences. Read over the instructions for your scrub or peel before you get started so that you have an idea of how it all works. It’s a good idea to have a dry exfoliating brush on hand too. This brush will help slough off some dead skin before you begin, which can make it even easier for your scrub or peel to do its job. Using the brush, make small circular motions on your legs with gentle pressure. It shouldn’t be painful, but you should feel it gently brushing away the skin. Rinse the dead skin cells away with lukewarm water and dry your legs. Now you can step into the shower or bath to start cleaning your skin before you exfoliate. When you exfoliate your legs, you’ll expose your new skin to any germs and bacteria that may be on your legs. Remember that, when you exfoliate, you’re removing old skin to let new skin come to the surface. This skin is more sensitive than old skin, so germs and bacteria can wreak havoc on its health. Cleanse your legs as you normally would with your favorite body soap. Use warm water to lather to let your pores open, which can help you clean deep into them. A loofah can provide a gentle scrub as you clean to remove some more dead skin cells that your dry brush may have missed. After lathering your legs with soap and warm water, rinse them thoroughly. Prop one leg up on the side of the shower or tub, keeping it away from the water. Place some of your exfoliating scrub onto one of your hands and apply it to your leg. Using your fingertips, rub the scrub into your skin with small, circular motions. Use this motion to cover your leg in the scrub, being sure to rub it into every part of your leg. Apply gentle pressure to prevent irritation to the skin. If you prefer, you can use an exfoliating mitt or loofah to provide extra abrasiveness to the skin. After you’ve applied the scrub to the entire leg’s surface, rinse your leg with cold water to close up the pores. Repeat this procedure on your other leg. When you’re done in the shower or bath, you can dry your legs off thoroughly using a clean, dry towel. After you’ve completed the exfoliation process, you’ll need to keep your application products, like your loofah, brush, or glove, clean to prevent harmful bacteria growth that can affect your skin’s health. 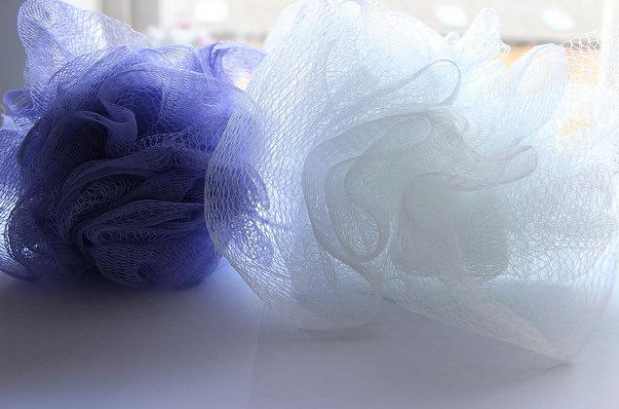 Keep a loofah or brush hanging in a dry location where they can air dry. Check the instructions of your glove to see how you should wash and dry it. Be sure to keep these products away from any area of the bathroom where they may be exposed to germs, like near the sink or toilet. Then, focus your attention on your legs. Moisturizing after exfoliating is vital to keep your new skin layers soft and healthy. Choose a lotion without irritating chemicals, dyes, and fragrances. Fragrance-Free, hypoallergenic formulas are a good option. You can also use coconut oil, which acts as a natural moisturizer and has additional healing properties to help new skin mend and repair itself. Exfoliating your skin at home is a simple process, but it’s one that requires you to know your skin type and how it responds to exfoliating. Start with exfoliating twice a week, adjusting as necessary based on how your skin reacts. Choose a mechanical or chemical exfoliating method, or create your own natural scrub using sugar, oil, and your choice of essential oils. Pre-treat your legs by exfoliating with a dry brush. You can then hop in the shower and use your scrub to slough of dead skin layers and allow new skin to come through. Now that you know how to exfoliate legs the right way, you’ll be ready for shiny, soft, and healthy legs all week long.